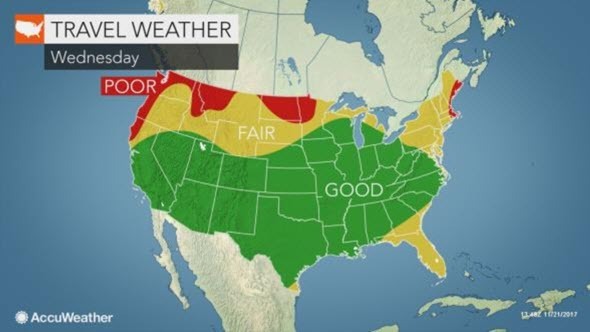 November 21, 2017 – AccuWeather reports rain may slow travel for a time in part of the east coast of the United States, while significant travel delays are likely in the Northwest and near the Great Lakes leading up to Thanksgiving. Tuesday, Wednesday and Thanksgiving Day represent some of the busiest travel days of the year for all means of transportation, according to the American Automobile Association (AAA). While the weather will cooperate for a large portion of the nation, there will be some areas of concern for holiday travel. In lieu of a major storm, a weak storm is likely to brush part of the Atlantic Seaboard prior to Thanksgiving Day. Wet weather is in store over much of Florida into Tuesday night. Rain is forecast to brush the coastal areas of the Carolinas and the mid-Atlantic coast late Tuesday night and then coastal New England on Wednesday. The greatest impact will be to motorists. Wet road surfaces and blowing spray may require lower speeds. How far west the rain extends will depend on how close to the coast the storm tracks. At this time any long-duration rain is not likely to occur west of Interstate 95 in the mid-Atlantic region. Areas right along the mid-Atlantic coast may get a few hours of light rain. A brief period of rain and snow may occur on the back side of the storm over the central and northern Appalachians and eastern Great Lakes from Tuesday night to early Wednesday. 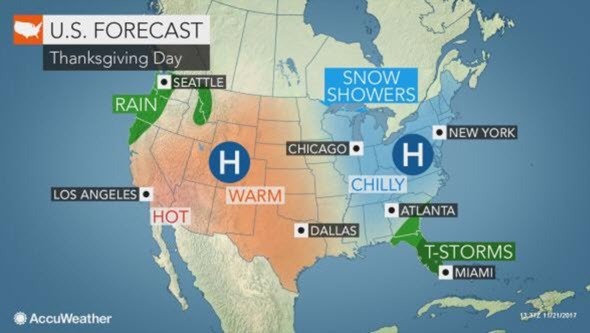 Another storm is forecast to bring more rain to parts of Florida on Thanksgiving Day, according to AccuWeather Meteorologist Fait Eherts. A new burst of cold air and a weak storm are forecast to produce spotty snow for the northern tier of the Midwest into Thanksgiving Day. The fresh batch of cold air will be accompanied by gusty winds over much of the North Central states. Winds may be strong enough to lead to airline delays even in the absence of any snow showers into Wednesday. As a pocket of arctic air races southeastward, it will briefly renew lake-effect snow from northern Michigan to northern and western New York, western Pennsylvania and northeastern West Virginia into midweek. Motorists should be prepared for sudden snow showers and rapidly changing road conditions on their travels in these areas. From late Wednesday to early Thanksgiving Day, a brief period of snow and/or freezing drizzle will develop over the northern Plains and slice southeastward across the Great Lakes. While only a small amount of wintry precipitation is anticipated, even a thin coating of snow or ice can cause great difficulty for motorists on crowded highways. Throughout the Midwest, there will be a couple of episodes of gusty winds that may lead to minor airline delays and tricky crosswinds on the highways. By far, poor travel conditions will be the most consistent in coastal areas of Washington and Oregon through Thanksgiving Day. Motorists venturing along the Interstate 5 corridor in the Northwest can expect rounds of drenching rain and periods of fog, according to AccuWeather Meteorologist Kyle Elliot. Lesser rain is forecast east of the Cascades. Snow levels are forecast to rise slowly into Thanksgiving Day. Motorists may encounter slushy and slippery conditions into Tuesday over Snoqualmie Pass along I-90 in Washington. Milder conditions will allow plain rain to fall from Tuesday night to Thursday. However, fog may accompany the milder air over the mountains, where snow remains on the ground. The milder air will allow rain to fall or a mixture of rain and snow to occur at most intermediate elevations of the northern Rockies, including many of the major passes. It is possible that flights originating from the Northwest, coastal Northeast and Upper Midwest may cause minor delays elsewhere across the nation into Thanksgiving Day. However, a large portion of the Southwest, South-Central and interior Southeast can expect good travel conditions. Showers are forecast to retreat to the Gulf of Mexico along the Texas and Louisiana coasts beyond Tuesday night.